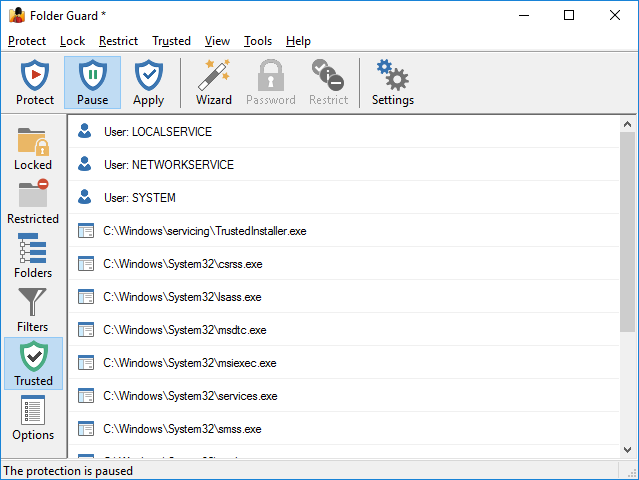 Originally, the Trusted list contains several system programs that must have full access to all files and folders on your computer in order for Windows to operate properly. When performing the protection, Folder Guard intercepts the requests from programs to open files, list the contents of folders, etc. If such a request comes from a program that is designated by you as a trusted one, Folder Guard passes the request on to the operating system without any intervention, thus allowing the program to have a full access to all folders on your computer. If the path of the program is not in the Trusted list, Folder Guard allows or denies such request according to the attributes of the files and folders set up by you. In other words, the Trusted list overrides other restrictions you might have set up with Folder Guard. For example, you could create a filter with Folder Guard that would deny access to a specific folder for a specific program, but if you add that program to the Trusted list, the folder will be fully accessible for that program. If you want to fine-tune the restrictions for a specific program, remove it from the Trusted list first. Note that only Windows applications (64-, 32-, or 16-bit ones) can be designated as the trusted ones. You may add a DOS program or a console application to the Trusted list, but it will not have any effect. Which programs should or should not be made "trusted"? You may wish to add to the Trusted list the system tools such as an anti-virus utility, a disk defragmenter, a disk scanner, a backup utility, etc. If you do so, you won't have to manually disable the protection before running such tools, since they will have a full access to all your folders and files anyway, as if Folder Guard was not present in your system at all. You probably don't want to make programs such as Explorer trusted, because if you do, they will be allowed a full access to all files and folders, even to those you have hidden or password-protected! I've made a program trusted, but it's still restricted. Why?